WHEATON, IL — Benedictine University recently hosted their 20th Annual President’s Invitational Golf Outing with golf legend Lee Trevino and CBS Sports analyst Gary McCord who were this year’s featured celebrities. The event took place on Monday July 28 at Cantigny Golf in Wheaton where area golfers had the opportunity to meet golf’s greatest and play a championship course all while contributing to a good cause. Proceeds from the event help provide scholarships for Benedictine students. Source: Benedictine University. Photo shows CBS Sports analyst Gary McCord (L) and golf legend Lee Trevino (R) who teed up July 28, 2014 at the 20th Annual President’s Invitational Golf Outing hosted by Benedictine University. Registration and breakfast began at 8:00 a.m and the golf began at 10:00 a.m. sharp. Cocktails and photos began at 4:00 p.m., followed by the program at 6:00 p.m. where McCord interviewed Trevino. Benedictine University is an independent Roman Catholic institution located in Lisle, Illinois just 25 miles west of Chicago, and has branch campuses in Springfield, Illinois and Mesa, Arizona. Founded in 1887, Benedictine provides 55 undergraduate majors and 17 graduate and four doctoral programs. Watch Lee Trevino deliver some of his famous golf tips. Lee Trevino won six major championships over the course of his career. He is one of only four players to twice win the U.S. Open, The Open Championship and the PGA. Gary McCord is a former pro golfer and sports broadcaster. in 1986, McCord joined CBS Sports as a golf analyst a capacity in which he still serves today. Sports Speakers 360 is a booking agent for pro athletes. 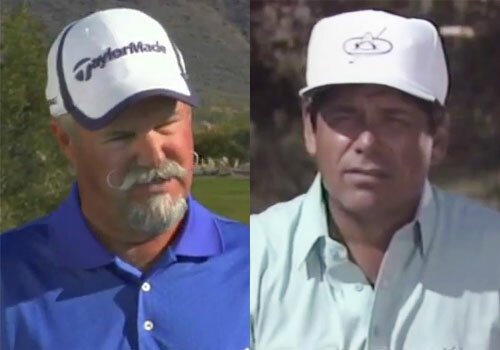 If you would like to book Lee Trevino or Gary McCord for an appearance, contact Lee Trevino or Gary McCord’s booking agent for fees at 1.855.303.5450.